Hey...take a look at this SNOW!!!! This is in Japan!!! 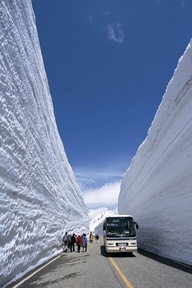 This is a HUGE snow corridor they had to cut through so the road would be open. I'm not so sure I would want to be in there...especially walking! Have they ever heard of cave ins????? eeeekkkkk!!! Now that's some snow! NO THANK YOU! LOOK AT THIS FUNNY GUY! 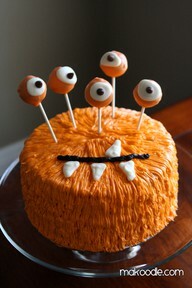 Isn't this the silliest, cutest Halloween cake you've ever seen? I can just hear the little ones giggling over it. 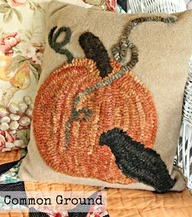 Then I found these gorgeous fall pillows. It's traditional rug hooking! Aren't they gorgeous? I love how they hooked straight through the fabric. 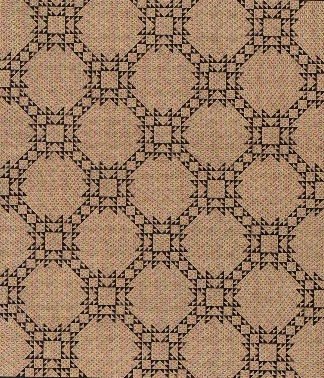 The rug warp is probably behind the fabric. You know how we've all got a list a mile long on the quilts we want to make before we leave this earth.... well...this is one for me. Ocean Waves. I especially love how they've make the sections of the wave different colors...and how pretty they all blend in together. The Flying Geese border is a bit bright for me... 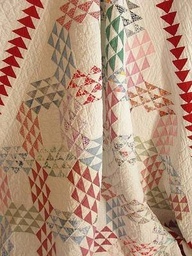 I think I would have liked it one of the colors in the quilt.... HOWEVER... that's what makes us all different... our right or artistry !! Isn't this clever. You take one of the noodles that you swim with... chop it into pieces this size...slit up the middle and then put on your doors. The article said they did this so their little toddler wouldn't get his fingers pinched in the doors within the house....! 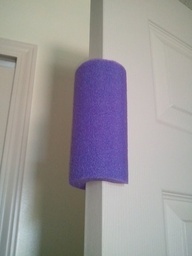 Hey... it's great too if you don't want doors to SLAM.. especially while the baby is sleeping! This is a neat trick.... they swear (on Pinterest) it works. If you have a grease spot on your clothing... rub is really good with white chalk. The bulk of the grease will adhere (soak) into the chalk and then normal washing will remove the stain! I think I'll try this on one of my hubbies shirts... he's always getting little stains on them! Hope it works! 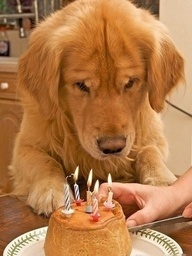 Isn't this cute.... it's this doggies birthday... he's anxiously waiting for his owner to stop messing around with the silly candles and let him EAT HIS CAKE! So sweet! Isn't is amazing how much our pets love us... unconditionally! What joy they bring to our lives! And here's another sweet "ahhhhh...moment". 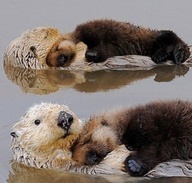 Baby sea otters taking a nap on their mommy's tummy... so they can get dry and warm. So adorable! Now that's what I call major floating skills! I texted Lisa and told her I had been making my 1" (finished) 1/2 square triangles... for HOURS.... pressing, pinning, sewing, cutting, ripping off paper, pressing, snipping.... whew... and I'm still not finished! OMG!! She and Amy (one of her gals) worked for 3 straight days on this...! So what's that telling me? I think I'm in trouble and looking at many more days of work. THANKS LISA!!! I'LL SEE YOU AT MARKET...HOPE YOU HAVE A BUNCH OF FUN NEW THINGS! I love going to her booth... she is so talented and I'm so very, very happy for her. 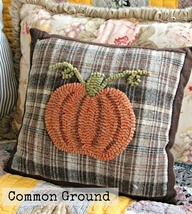 All of my friends are doing so well in the quilting world... it makes my heart SING!! Red Crinoline Quilts.... Paula and Maryellen... they texted me yesterday and told me Quiltmania was coming to Paula's house to take pictures. They are going to be featured in an upcoming issue. Won't that be fun to read? !!! 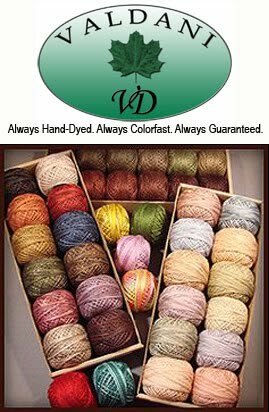 Pam Buda - Heartspun Quilts... she's now known for her "Prairies Women's Sewing Circle" and is now designing fabric for Marcus Brothers! Isn't that cool?! Yippee for all of them....! Ok...now I'm going to the washer and dryer!